Mussolini the Leader (Duce). A massive obelisk, thrusting tumescently against the sky, alerts us to the phallocentrism of the Fascist worldview -- you can't get more explicit than this. By the architect Costantino Costantini. 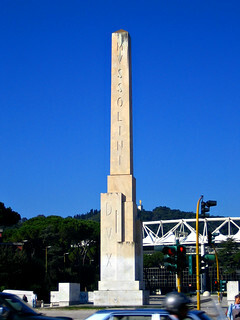 Imagine a similar obelisk in Berlin, with the words "HITLER FUHRER" written down it. Would it still be standing? No way. The Italians have a different relationship with their Fascist past than do the Germans. A less honest, more indifferent attitude.